Challenged, he set about finding how that could be so, not only for Denmark, but also for the other four countries of the expanded description of Scandinavia—Iceland, Norway, Finland, and Sweden—that share a common Nordic heritage and today have flags of differing colors but geometrically like designs. He sought to create an entertaining contribution to travel literature that would be an alternative to the consistently positive descriptions of Scandinavia in English media. • Chapter 1: Dirndis, in folklore, the word for a the style of a peasant woman’s dress, focusing on the Syttende Mai celebration in Oslo. • Chapter 2: Egoiste, an Anglicization of the French word égoïste, meaning a selfish person, focusing on the July 22, 2011, mass murder of 77 people by far-right extremist Anders Behring Brevik, and the effects it has had on the conscience of the country. • Chapter 3: The new Quislings, focusing on the much-debated rise of a new extreme right, in part as an aftermath of atrocious mass murder of July 22, 2011. • Chapter 4: Friluftsliv, the Norwegian word for “outdoor life,” focusing on the prevalent Norwegian penchant for it. • Chapter 5: Bananas, an examination of the transformation of the country brought about by oil-driven wealth. • Chapter 6: Dutch disease, an examination of the impact of oil-generated income on the economy. • Chapter 7: Butter, reflecting the happening in 2011 of the country running out of butter, in part due to restrictive tariffs on imports implemented to protect domestic producers, arguably reflecting isolationism. To date, the book has received mixed reviews, ranging from praise for its informative approach to critique of its sometimes strained humor. Moreover, within the genre of travel literature on Norway in English, there’s the formidable heritage of three landmark titles. The first is American, The Innocents Abroad by Mark Twain, published in 1867. The second is English—Three in Norway (By Two of Them), by James A. Lees and Walter J. Clutterbuck, published in 1882, and to date the most frequently reprinted travel account for Norway; today Amazon.com lists six editions of it. The third is American, Northern Paradise: The Intelligent Alien’s Guide to Norway, published 1963 by Philip Boardman, the initiator and long-serving director of the International Summer School of the University of Oslo, initially an incentive for American students, in thanks for the educational opportunities provided for Norwegians in the USA during and after World War II. Whether The Almost Nearly Perfect People will locate well against that historical backdrop remains to be seen. 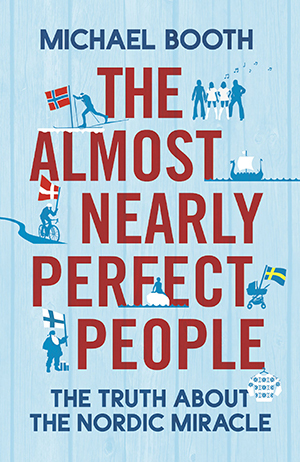 The Almost Nearly Perfect People, by Michael Booth, was published in 2014. There’s also a Norwegian edition, Nesten Perfekte Folk, translated by Tom Thorsteinsen.